NEW! Change your perception of what a home elevator can be with the Savaria Vuelift Round. Currently available in our CT and RI markets only. A stand-alone solution that does not require construction of a hoistway, the Savaria Vuelift elegantly ascends within your home’s existing architecture. 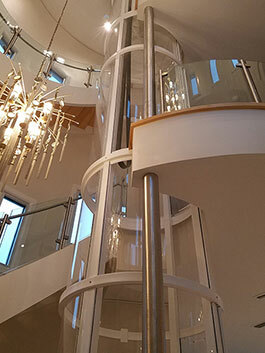 While ideal for renovations, it can also be the centerpiece of a new home design; for example, many architects place the cylindrical elevator within a spiral staircase. The Savaria Vuelift is an investment in beauty and convenience for today, and ensures mobility and independence for your future. Have your Freedom When You Invest in a Home Elevator. If you think a residential elevator will allow you to remain safe and independent in your own home, set up a free in-home evaluation and demonstration. We will provide a no-obligation quote. Our installation staff is factory-direct trained and licensed by the State Department of Consumer Protection and the State of Rhode Island Department of Labor. There’s no sales nonsense- just plain facts and great pricing. Discover why more and more people are buying Elevators from Freedom Lifts, a trustworthy, locally owned and operated company. Providing stair lifts, elevators, and wheelchair lifts to Connecticut, Rhode Island, and Massachusetts for over 30 years. © 2016 Freedom Lifts, LLC. All Rights Reserved. Connecticut Elevator License #400100. Rhode Island License #80.